Hello, fellow Pokemon hunters. I just wanted to make a thread in regards to information on the distribution of the Tamamushi University Magikarp event, that took place in Japan. I am already aware of the 20 Dragon Rage Magikarp that were distributed in the Gen 1 games, paired along with the rare trophy card in the TCG, as well as other merch. My main onjective at the moment is to find anyone that might have any info on the actual Magikarp that was distributed in game to the winners. What I hope to do is open up a discussion that could lead to similar results as the thread that brought about the Gen 1 Mew being transferred and redistributed from save files before the internal batteries died. If anyone has any info, or even could act as a middleman or translator for other Japanese forums, any help would be greatly appreciated. 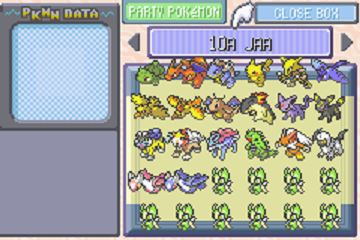 PokéYOG1 is officially DEAD! Since when? Since December of 2011. Why? Because my life had become so stressful from a number of things, mainly the unknown disappearance of my Nintendo DSi, and school. What's new? Well, I have a Nintendo 3DS, and Pokemon Black Version 2 (English version, of course). I also have Pokemon Rumble Blast, and I run a Minecraft server much like I used to run this GTS Distro. Also, my computer crashed in the summer of 2012, and I had to wipe out my hard drive and re-install Windows. I still have Pokemon Black Version (the first one), and I'm pretty sure my copy of Pokemon White is in my long-lost DSi. Sorry for the inconvenience. You can view the old content of this post in the spoiler below. I had my HYPER GTS server up a few months back, I ended up using it for a short period of time. After having my router company (D-Link) open up all of my ports I was able to send the pokemon to different people, having my own server. Anyways, now I tried to re-open my server and it gives me this error message at the start of the DNS screen. "Unable to get your IP automatically check your connection" When I type in my external IP address into it, works. Then I connect my DS and plug in the external IP it connects and sends to me. BUT when I try to get a friend to do it, it gives her error code:52100. How can I fix this? Also if this is the wrong place to post this, kindly let me know and I'll delete it and move it. :bidoof: Edit: I should also add that I called my ISP provider and they said all of my ports are open. Will there ever be a GTS distribution application for Gen 6? In the same vein as the distributors that ran on ShinyGTS/DTS, will there ever be an equivalent for X/Y/OR/AS? I have heard that it's theoretically possible, but a lot of hard work. Is it really possible, and if so, is the sheer amount of work required in order to develop such software the bottleneck on it becoming a thing? http://wiibrew.org/wiki/GEMS_Wifi Why I can't make it: I wish I could code these things myself, but I'm not really much of a programmer myself and don't know how to use DevKitPro or any good at C++ for compiling homebrew apps. Also, I don't own any compatible Wireless devices (RT2500~60 Chipset) with for capturing things like DS and Wii Signals other than the devices their selves. What it would do (More to come): A Homebrew Application strictly for sending Generation IV & V (Even though there isn't anything yet, It'll probably be fairly easy to dump them from Saves with Hex Editor just like I've done for HG/SS before programs were able to do it for you in Saves. Generation V should and will have WCs like GIV despite opinions) Wonder Cards wirelessly to the DS through *.pcd files. Having a Folder and selecting which Wonder Card you want to Distribute. Things to be added later: Wonder Card Picture Previewer (like Pokémon Mystery Gift Editor and it's Show Card Preview feature) [Vertical and Horizontal for 16:9 and 4:3 TVs] Cry Sounds when in Distribution Mode PKMN Sprite (Could have detection for Wonder Card Distribution Value, if Platinum shared, Platinum Sprite and so forth. Maybe a Box above the Wonder Card display) Throbber (Could have the PKMN Sprite Animate once sending the Wonder Card, or a simple square throbber) Settings to restrict Wonder Card's Distribution Value for each Game Version (Distributions for certain versions / All Versions) Wonder Card Queuer (Press a button to move onto the next Wonder Card in a folder, or select which Cards to Distribute, and hit a button to move on to the next queued Wonder Card) Wonder Card Capture Mode (Capture a Wonder Card that's in hosting mode and saves it as a PCD file) [Thanks to trance for the idea!] Concept Layouts (Might change the BG to a Darker Blue Tiled one for less eye strain): [Wii] Before Distributing (Press A to Distribute w/Animate and Sound Cry): [DS](Animated GIF) Before Distributing (Press R for Card Switch, A to Distribute w/Animate and Sound Cry on Card): How it would be useful: Anything you could think of really. Not having a Flash Cart but a Homebrew Channel on the Wii with a Retail Copy and DS. I mainly use custom Distribution Roms with Patchers to send my Wonder Cards to my games. I'm quite tired of using these things even though it's basic as can be. Plus it would conserve space not having multiple files that are 8MB/1.5MB. Where as it would take up 856 Bytes times around how many files you have on your SD/microSD/microSDHC Card. Conclusion: In the end it's also just as legitimate (Legal, for people using that terminology) getting the Event as long as you had the Wonder Card straight from the Event. It's a steal, and as great as acquiring an Event legitimately like PBR Pikachu for instance. It's the perfect bargin and solution for people not wanting to fiddle around with their Networks for the GTS exploits, and want a generated Pokemon with a different Nature randomly. If developers didn't decide on it originally because of some single Event that was made up by a fan, then why not a Wii Version? It's not like anyone is going to take their Wii to an Event and distribute some derogatory thing. Besides, PP does have some programs that deal with Wonder Card files at least. Why not? If it hasn't been thought of before. This is something to keep in mind though. I have a contact that has knowledge of sending Wireless Signal activations through compiling his own custom applications to a few DS games of the Rockman (Megaman) Series of games. I'll ask him if nobody else knows much about Wonder Card signals. Either that or I'll purchase a PCI Card that has the Chipset itself eventually for reading the WC Signals and attempt to figure it all out on my own. Both ways will take a long time probably. Thanks for reading.